Mass Schedule Sunday, 7, 9, 11 a.m. (sung Mass). Monday – Friday, 6:30 a.m. Tuesday & Thursday, noon. Wednesday & Friday, 6:30 p.m. Saturday, 6:30 & 8 a.m. All Latin Tridentine. Confessions Monday – Saturday, 30 minutes before Masses. Saturdays, 3:30 – 4:30 p.m. Sundays, half hour before Masses. Weekdays, half hour before Masses and by appointment. Names of priests Fr. Michael Passo, FSSP, pastor. Fr. Michael Malain, FSSP, assistant pastor. Music On Sundays, organ during the 7 & 9 a.m. Masses; the 11 a.m. is a sung Mass. Frequently there will be a sung Mass during the week, too. School No, but there are catechism classes. Parking You can park in lots on either side of the church. Cry room No, but you can go into the vestibule, which is separated from the church by glass. Additional observations Mater Misericordiae Mission is served by priests of the Priestly Fraternity of St. Peter, which celebrates Mass according to the 1962 missal. It’s a simple brick building that was formerly a Baptist church, acquired in 2010 and renovated. It has a traditional altar flanked on either side by statues of the Blessed Mother and St. Joseph. 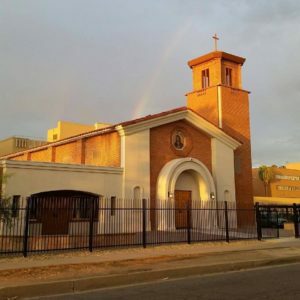 It’s located in downtown Phoenix, about five minutes west of the chancery office. Liturgies are impeccably done; sermons always orthodox. 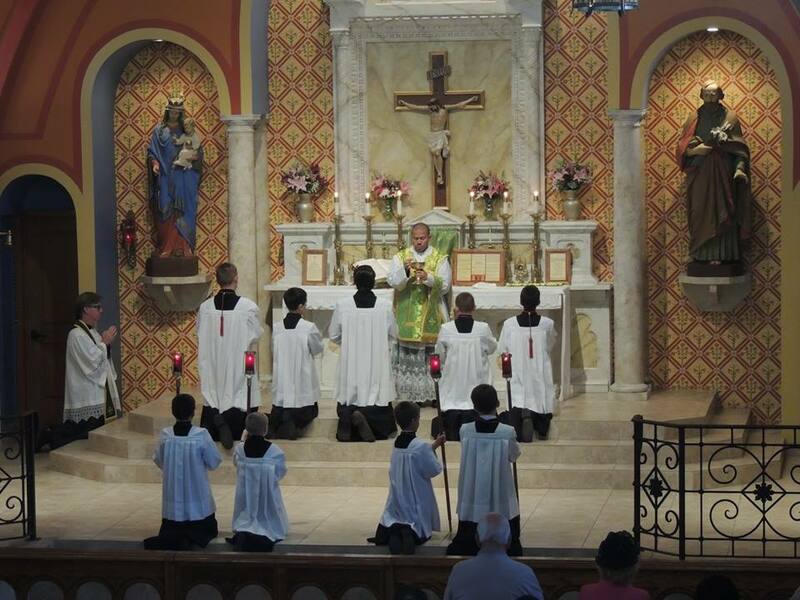 The FSSP priests also serve other churches in the diocese; see the website for Mass times. Mater Misericordiae Mission made the national news in 2014, when an intruder murdered the associate pastor, Fr. Kenneth Walker, and seriously injured the pastor, Fr. Joseph Terra. I welcome Latin Masses for those who prefer them. All churches that offer the Tridentine/Gregorian/Traditional Latin Mass are worth driving to, even if it means a lot of driving. By the looks of the high fencing around the perimeter the parish is in a bad part of town. Also, the murder of a priest on the property confirms that judgment. Thank you for your wise “judgment,” whatever that means. It’s not the greatest part of town, but not the worst either. We do the best we can. The parishioners spend resources on having many children. The Church property is bordered by acres of Arizona state agency offices and parking structures. The murder of Father Walker, an extraordinarily holy priest, was at night, almost 5 years ago. The rectory is no longer at the Church site. A uniformed police officer is present at Sunday Masses outside the door. It’s safe for Mass, if that is your concern. Have you ever been to downtown Phoenix? Please show up and see how the other half lives. I think the existence of a parish like this in the Catholic Church is a shame. Pope Benedict is the direct cause of much division in the Body of Christ by generally allowing people not to observe the Spirit inspired changes in Liturgy promulgated by Vatican II. If this permission was not given there would be no divisions in the liturgical life of the Church, and certainly no condemnation of people accepting the teaching of the Second Vatican Council that so many, not all, of the proponents of the Latin Mass express with much scorn. Very sad. Thomas, there were no divisions prior to Vatican II, but afterwards there are aplenty! At our NO parish we have English, Spanish, Chinese, Vietnamese Masses weekly. We are only allowed one Tridentine Mass per month. If you don’t think there are divisions you need to attend one of these parishes! Each group stays to itself and does not include others in their functions (except English, who invite all). There’s so many languages going on its like the Tower of Babel! Now thats division!